Fresh research into search engine ranking factors highlights a number of trends on the rise that you should incorporate into your strategy for 2018 and beyond. Previously unreleased data from studies on SEO ranking factors were announced recently at SMX East during presentations from both SEMrush (2017 ranking factors: update) and Searchmetrics (Why general ranking factors are dead). In this post, I will run through the key findings from both studies and highlight the factors I believe SEO practitioners should be prioritising today. As part of their 2017 ranking factors research, SEMrush looked at the correlation between HTTPS implementation and rankings by calculating the percentage of domains that have HTTPS enabled using the top-100 results for over 600,000 search queries. What they found was that the higher the position in the search results, the more HTTPS sites there were appearing. This shouldn’t come as a surprise, Google have been discussing HTTPS as a ranking factor for a few years now and have recently started displaying non-secure messages in Chrome for data entry on all non-HTTPS sites. What Should You be Doing About HTTPS? There can be no doubt that moving to HTTPS will give your site a slight jump on any non-HTTPS competitor sites in Google’s results, however the importance of HTTPS as a ranking factor does differ based on industry. For example, if we look at the data on HTTPS from Searchmetrics study on industry ranking factors, you can see that Google seem to place more value on HTTPS in sensitive industries such as finance vs. industries like travel. This means that if you’re attempting to rank in sensitive industries such as financial services or for high volume short-tail keywords then you should prioritise migrating to HTTPS to avoid losing ground to your competition. Page load speed has been increasing in importance since mobile search surpassed desktop in 2015, and Google have been actively pushing page speed as a ranking factor since 2016. Indeed, recent data indicates that the minimum threshold for top-10 page load time is continuing to increase. During his recent talk at SMX, Marcus Tober of Searchmetrics reported that average page load time of the top 10 search results has decreased (sped up) by 2 seconds compared to 2016 according to their research. What Should You be Doing About Page Speed? The average Page Load Speed of the top-10 results is getting quicker, so it’s essential that you act to continuously improve page load time across your site if you want to retain or improve your performance in Google’s results. There are a range of tools SEO’s can use to optimize page load speed. These include Google’s Page Speed Insights tool, Pingdom tools and GTmetrix’s performance optimization tool. 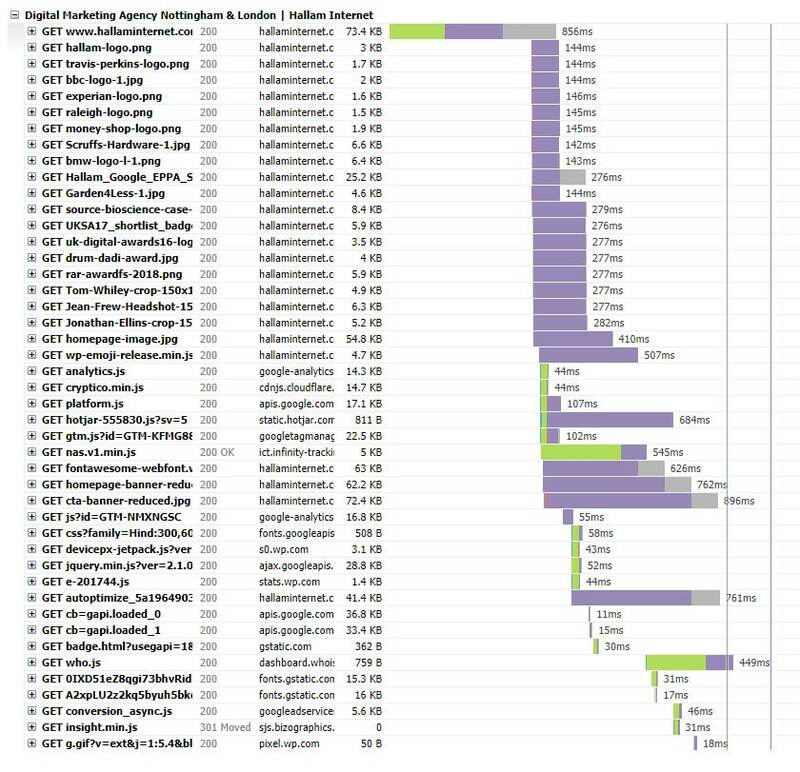 For specific page speed improvements I would recommend using GTmetrix’s waterfall report. This report will allow you to view server response times and prioritise which elements to optimize based on relative load time. Outside of your desktop/responsive site, I am a huge advocate of the AMP project and would suggest considering this if you have development resource available to implement an AMP version of your site. Implementing an AMP version of your site would provide users with a lightening quick version of your pages which (if implemented bug free) would have a much better chance of ranking in Google’s mobile-first index. 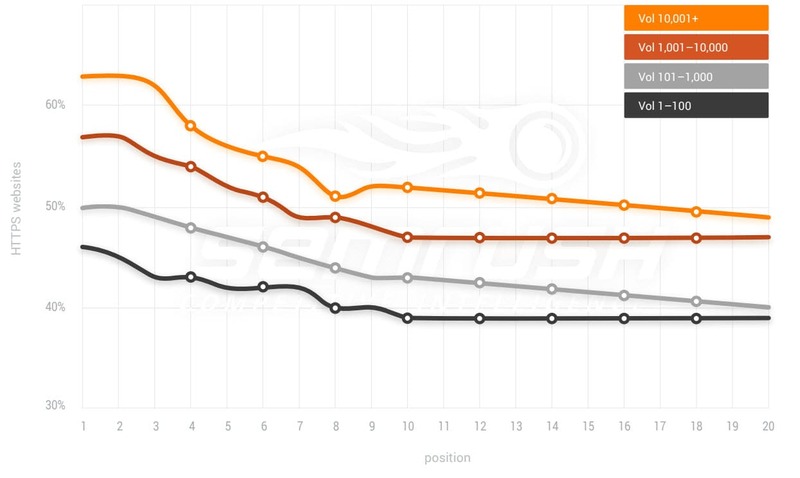 It’s commonly accepted that including keywords in page titles, meta descriptions and body copy is a key aspect of on-page SEO, so SEMrush carried out some analysis to test whether the presence of keywords in various on-page elements actually influences page rankings. In their research, SEMrush analyzed 600,000 search queries and calculated the percentage of pages that included a keyword in different page elements. It’s no surprise that including keywords in page titles, meta descriptions and body copy seems to be common practice. However, it’s interesting that the trend curves actually appear relatively flat across all keyword volumes, indicating that the occurrence of a keyword in the page title doesn’t have a noticeable influence on rankings. This research seems to indicate that simply optimising on-page elements to include target keywords will no longer give websites an advantage over their competition as it’s clearly not a differentiating factor Google can use to determine the actual quality of a site. What Should You be Doing About On-page SEO? This is not to say that including relevant keywords in on-page elements isn’t important, but doing so is no longer going to give sites a competitive advantage in the search engine results pages. In fact, it’s now more important to diversify the semantics of your page content and make the page more relevant to a broader range of keywords than it is to repeatedly stuff it with the same target keyword. When reviewing the impact of content length on rankings, SEMrush found that pages triggered for long-tail search queries typically have a higher word count than pages triggered for short-tail keywords, almost 20% higher. This makes perfect sense; if you are writing on a broad topic (e.g. “home insurance providers“), your users will not expect a long read. If the search query you’re trying to target is highly specific (e.g. “how to choose home insurance providers“) then the page should provide more in-depth content. What Should You be Doing About Content Length? The research indicates that long form content tends to be more valuable in targeting long-tail search queries, however I would also advise that SEO’s assess the types of results being triggered before jumping in to writing lengthy articles around a topic. There is no one size fits all approach to content length and the amount of content required on a certain topic depends on the type of query you’re looking to target and the kind of results typically triggered by those search queries. This brings us back to looking at search queries by industry rather than thinking of ranking factors more generally, as the types of results triggered will differ by industry. For example, the use of video would be a better strategy than writing long form content on the topic of health and fitness than it would be if you were writing about furniture. Google (and users) clearly value video content more in the health and fitness industry and publishers would stand a better chance of claiming top-10 positions by creating content in video format vs. a written post. 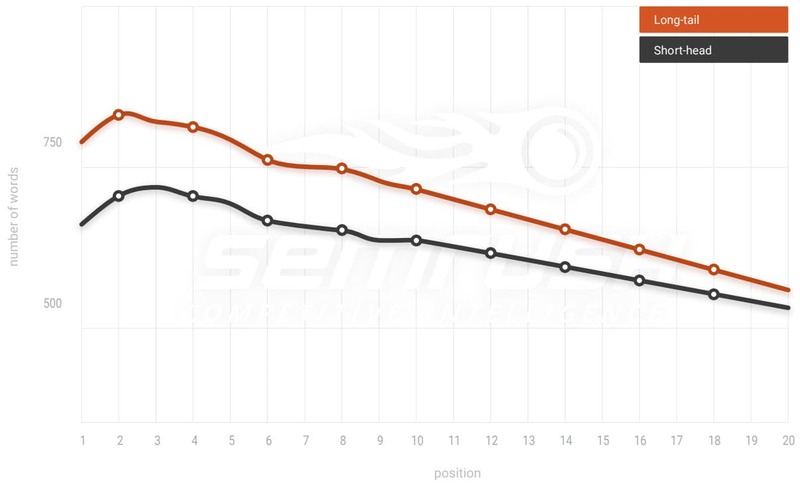 To assess the current importance of links on rankings, SEMrush reviewed the correlation between the number of referring domains pointing to a website and that website’s positions in Google’s search results. 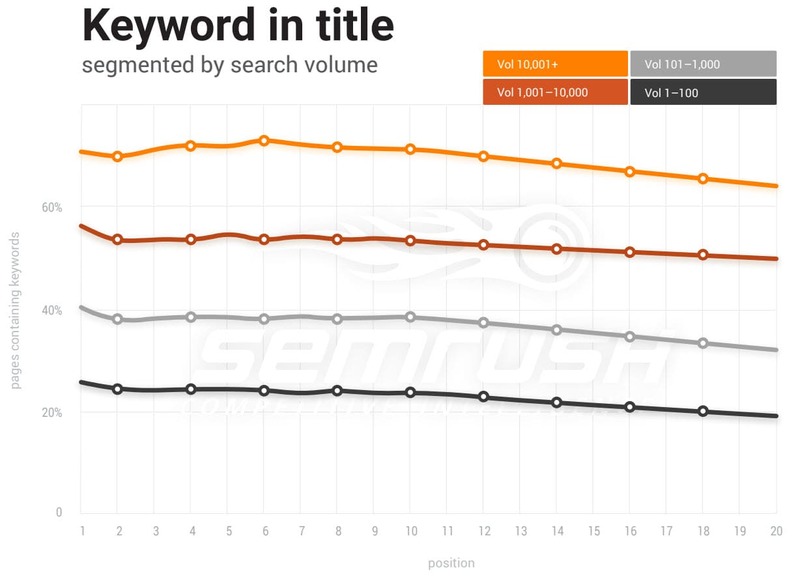 SEMrush found that the websites that appear on page 1 for high-volume keywords have significantly more backlinks than ones that appear for low-volume keywords — almost 10 times more. Essentially, the more popular the keyword, the more backlinks from unique domains you’ll need to get to compete in Google’s search results. What Should You be Doing About Backlinks? The number and quality of backlinks pointing to a site is clearly still an important factor used to rank sites in Google search. The one element missing from this research is a quality assessment of the links pointing to sites in the top-1o results, as there’d be little point building thousands of links from irrelevant of spammy domains, in fact this will actually harm organic performance. Websites caught trying to quickly game the system by buying links or participating in link schemes risk severe penalties that will drop their rankings off a cliff, so I’d recommend sticking to tried and tested long-term link building practices like those listed above. SEMrush research shows that the higher the position in Google’s search results, the more HTTPS enabled sites there are. HTTPS seems to be a more prominent ranking factor in sensitive industries such as finance. HTTPS implementation could give you a slight boost against non-HTTPS competitors in Google’s search results. The average page load speed of Google’s top-10 results is getting faster – 2 seconds faster in 2017 vs. 2016. SEO’s must focus on continuous improvement of page load speed using tools such as Google Page Speed Insights and GTmetrix. Webmasters could get a competitive advantage in Google’s mobile first index by carrying out a successful AMP implementation of their site. Keyword inclusion in on-page elements is now commonplace – it’s no longer going to give sites a competitive edge in Google search. Including keywords in on-page elements is expected, but SEO’s should focus more time diversifying the semantics of a website’s content to make pages more relevant to a broader range of keywords. 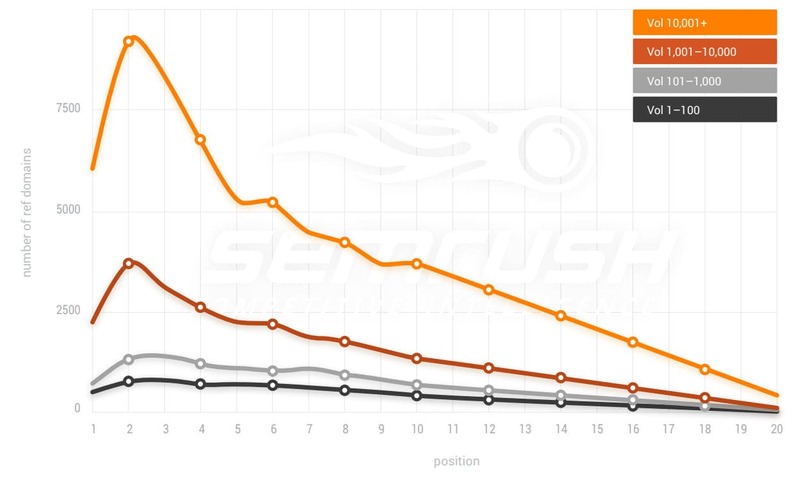 SEMrush research shows that there is a correlation between high ranking pages and pages with a high word count. Word count is higher for high ranking pages targeting long-tail search queries. SEO’s must also consider the types of results triggered for different queries rather than simply focusing on word count – e.g. videos content. Links are still an essential element of ranking well in Google. SEMrush research shows a correlation between number of referring domains and rankings, especially for higher volume search terms. SEO’s should focus on long-term ethical link building practices to build authority in their site. In-post screenshots and imagery taken / created by Ben Wood, November 2017. Data and graphs: SEMrush 2017 ranking factors study and Searchmetrics ranking factors study. Thanks for this compilation. Good quality content is undeniably the number one aspect to focus on!